Bordering the City of Pittsburgh on the south side, Mount Lebanon provides Fire & Rescue protection to a 6.2 square mile response area. Within their response area are 12,000 residential homes, 200 apartment buildings, 30 assistive care facilities (nursing/group homes, assisted living), 5 schools, 16 churches, a 350 bed hospital, regional mall, a light rail transit line and 75 mid-rise buildings ranging from 4-7 stories high. 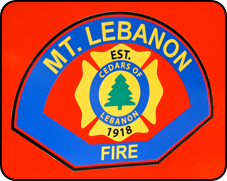 A combination department of 60 firefighters, Mount Lebanon holds the distinction of being one of only 160 fire departments in the US & Canada that have achieved “Accredited Agency Status” through the Commission on Fire Accreditation International after a 6 year long effort to meet exacting standards which focus on 250 performance initiatives. A twin to Engine 2, this rig which seats six features a 15KW hydraulic generator powering 7,000 watts of quartz halogen lighting including Night Scan Chief light towers. 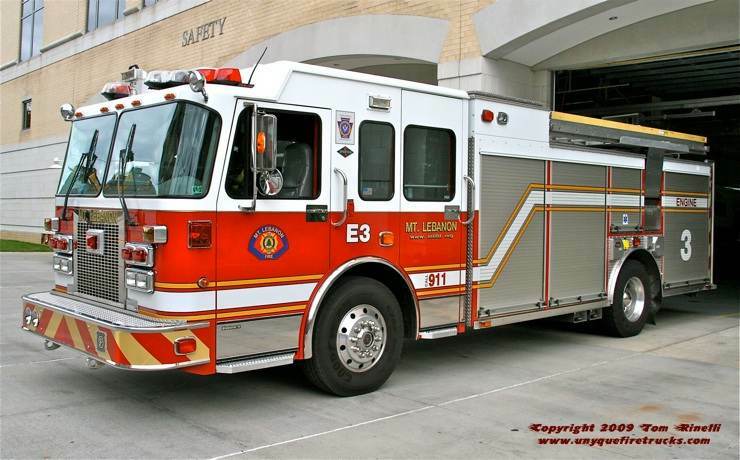 Set-up for a variety of operations, it is equipped with 1,200’ of 5” & 600’ of 3-1/2” supply line, a portable deck gun pre-connected to 150’ of 3-1/2” supply line, 114 feet of ground ladders, Hurst high pressure combination rescue tools, DeWalt 36 volt cordless tools and cribbing. In addition, it also carries assorted meters, BLS equipment including an AED & animal oxygen masks, two high rise bags, RIT tools, lock-out/tag-out kit, PPV, saws, PFD’s, throw bags and Level B Haz-Mat protective gear. The vehicle is designed to support many rescue disciplines including vehicle, trench, elevator, high/low angle and confined space as well as provide Haz-Mat mitigation supplies, cascade filling, illumination of emergency scenes and acting as the primary Rapid Intervention Team unit. Equipped with seating for six, it features a 21 foot non walk-in box with hydraulic, electric, low pressure air and high pressure breathing air reels. Outfitted with a 30KW hydraulic generator, it powers a total of 10,450 watts of quartz halogen scene lighting including a 27′ vertical light tower equipped with two 1,000 watt metal halide floodlights. A total of three winches are available including a portable 2,000 lb. gasoline-powered unit, a vehicle mounted 5,000 lb. electric unit which can be attached to either side or the rear & a 12,000 lb. electric front bumper mounted unit. A six cylinder cascade system with fill station, 1,500 watt portable generator and laptop computer complete with a VIN bar code scanner rounds out the vehicle’s onboard features. Its’ impressive equipment complement includes Hurst high pressure hydraulic rescue tools, DeWalt corded/36 volt cordless hand tools, over 100 pieces of cribbing, a full air bag system with foot pump (64 ton capacity), hydraulic jacks (114 ton capacity), assorted gas & electric powered chain saws (circular, ventilation and concrete cutting), 56’ of ground ladders and thermal imager. In addition, it also carries a tri-pod, four supplied air respirators, a trench/air knife, pre-connected reciprocating saw & air chisel, an oxy-acetylene torch and equipment for RIT, trench, collapse and water/ice rescue (including snow shoes). BLS medical equipment including an AED (with 3 lead monitoring capability), MCI supplies and seven SCBA complete the inventory on this rig. 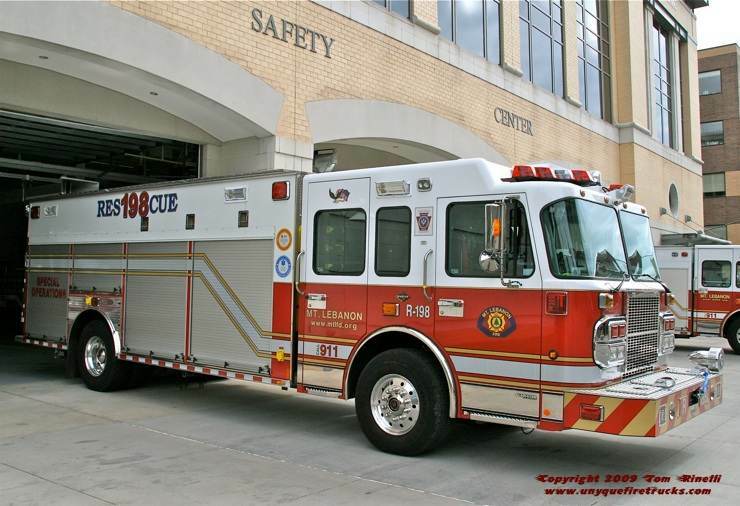 Rescue 198 carries some “unyque” items among it’s lengthy equipment inventory including an animal control device, collapsible garbage cans, food supplies for rehab, over-the-counter medications for rescuers and even toilet paper (now THAT’S pre-planning!!). 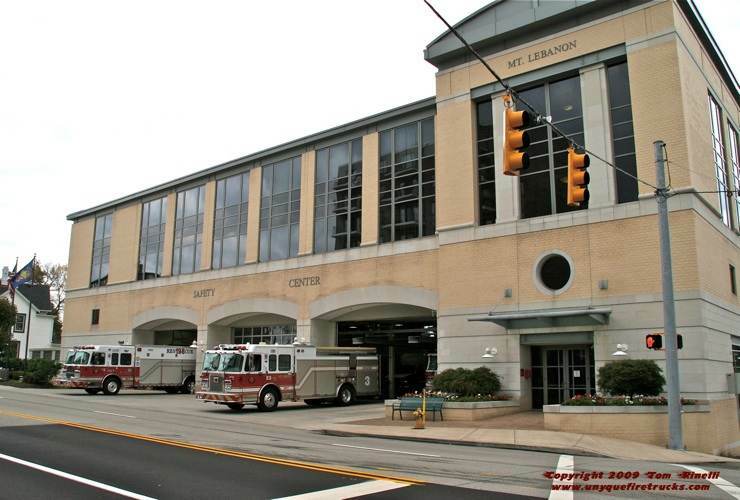 Mount Lebanon operates their entire fleet from this combined public safety center which houses the combination staffing of the fire department as well as the police department.